Business technology media has undergone a huge transformation since the dot-com revolution of the late 1990s, with many once-high-flying print outlets now only a distant memory. Yet, despite the transition, the category remains viable, especially online, because so many companies rely heavily on their IT departments for their day-to-day operations. “There may be fewer print reporters, but there are actually more journalists covering business technology than there ever has been,” notes Tim Smith, founder of San Francisco-based Element PR. This shift from print to Web-based journalism has enabled many business-tech outlets to change from breaking general business tech stories to focusing on sections that explain specific IT challenges. “We're not really a news-driven publication, but we have a large stable of bloggers – only a minority of which are on staff – who specialize in writing about open-source, mobile, or cloud computing,” says Eric Knorr, editor-in-chief of InfoWorld, which moved to a Web-only platform last year. 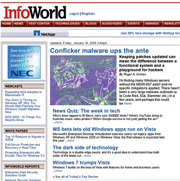 Knorr says that he and his staff welcome PR pitches, but concedes that InfoWorld is not easy to crack. Smith adds that the shift to online has done more than drive specialization among reporters – it's also altered the business tech news cycle. But unlike other media categories, business-tech journalists are comfortable with the latest multimedia tools, says Jared Leavitt, market intelligence supervisor at Access Communications. “These reporters are... interested in taking videos, slide shows, blog links, and any other content that will enhance their story,” he says. However, one thing that hasn't changed in recent years is that business tech reporters remain wary of anything resembling technologies that are announced by developers but never actually go to market. That means business-tech reporters are unlikely to pursue trends or profile companies unless they can talk to real customers who can attest to the effectiveness.